pH Indicator Paper or pH test paper is used to measure pH quickly, easily and without calibration. 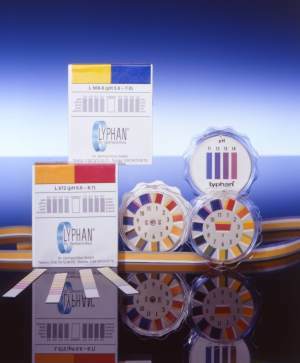 Whenever it’s necessary to measure pH, the company Dr. Gerhard Kloz GmbH offers several types of pH indicator strips and pH papers as standard products. Special orders of customized pH indicator paper and pH test paper are available on request. You can buy LYPHAN pH indicator paper directly from us. To contact us, please click: here.